On August 2nd, Microsoft launched its Windows 10 Anniversary Upgrade, which some say is equivalent to the Service Pack 1 milestone that many enterprises are waiting for to start seriously with the migration plans. So, the migration race from Windows 7 and the much-derided Windows 8 is well and truly on as more than half of enterprises globally are planning to build their migration engine for Windows 10 in Q3/2016. Having said that, executive management (CEOs, CIOs, CTOs and CFOs alike) need to read up and get informed about what is involved. But with so much contradicting information floating around, so many obstacles to overcome and so many questions to answer (e.g., How much budget do we need?, Can we insource or should we outsource? Should we hire a large service provider like HP Enterprise, Atos, Fujitsu, MCS or Wipro? ), executives are often not sure how, or if, they should proceed. 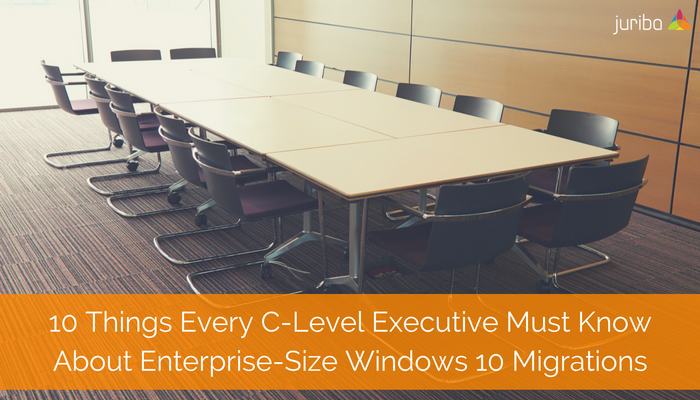 To make your life easier, we put together an Executive View on Windows 10 migrations. Since we have helped ready close to 5 million assets for migration, we know that executive buy-in is crucial to the success of this mission, but buy-in starts with a true understanding of what is ahead and what is involved in the venture. 1) The Migration Race Is On! Make Sure You Don't Get Left Behind. There is no getting around the fact that Windows 10 is here and it is here to stay. Now that the 1607 upgrade has been published, enterprises around the world are scrambling to migrate. According to a Spiceworks report, 60% of the IT departments surveyed have already tested Windows 10, and 40% are planning to roll out Windows 10 this year, as compared to the 74% that are shooting for early 2017. But it is not only the IT teams who are driving the enterprise adoption of the fastest-adopted Operating System in Microsoft's history. According to Forrester, 38% of workers who use a computer say they want Windows 10 on their next work laptop, with 9% already using it on their primary work device. And there is a good reason for the fast pace of adoption: Windows 10 has much to offer compared to its predecessors, Windows 7 and Windows 8.1. Windows 10 offers enterprise data protection for personal and corporate data protection wherever the data flows. Windows Defender takes care of the ever increasing malware problem. Also, Microsoft made great leaps regarding productivity. The company touts a 188% Return-on-Investment as Windows 10 delivers faster boot time, better performance for Office applications, faster Internet Explorer response times and better battery life. However, the biggest change is that the operating system will no longer be delivered as a piece of software that is locally installed on end-user's machines as new updates and upgrades hit — Windows 10 is Software-as-a-Service. When Microsoft announced Windows 10, the company also announced that this would be the last Windows Operating System ever released. No, Microsoft is not folding its profitable operating system division; it just won't release a new version. That is because Windows 10 is completely rebuilt from the core to be regularly updated with minor security updates and 1 or 2 feature upgrades a year — hence the name Windows-as-a-Service. What does that mean for your organization? Well, as daunting as it sounds, it is great news. It means no more lengthy and costly big bang migrations whenever a new version comes out. It also means that, depending on the servicing branch (e.g., Current Branch, Current Branch for Business or Long-Term Service Branch), you will receive regular automatic updates which will make your IT landscape more secure and less vulnerable to attacks. It also means easier software license management, especially if you decide to move to the new E3 licensing plan. In July 2016, Microsoft announced its new Software-as-a-Service (SaaS) pricing model for Windows 10 Enterprise E3. Enterprises will have to pay $7 per user per month (or $84/year), which licenses each user for up to 5 devices. 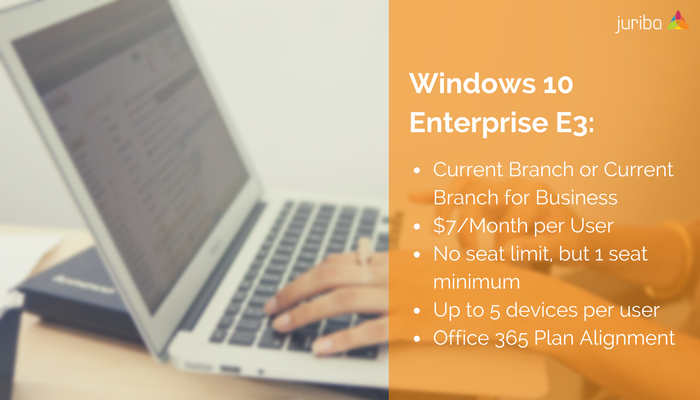 There is no seat limit, and it is available for Current Branch and Current Branch for Business users. 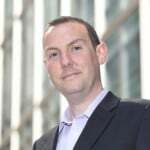 Most enterprises will see this as welcome news, as there is no risk of under- or over-licensing anymore and because it aligns with the Office 365 nicely, it will make the management of software licenses so much easier. Any IT transformation project that involves tens of thousands of users is a logistical nightmare as your IT team will have to juggle end-users, devices, locations, applications and so on. A big bang Windows 10 migration is no different. TRADITIONAL APPROACH - 124 WEEKS: You can go the traditional route of using Excel spreadsheets or hand-cranked databases. However, these tools are not adequate for the complexity of this project; the spreadsheets are instantly out-of-date and your team will have no way to properly categorize, normalize or prioritize anything. This is slow, inefficient and very risky. ACCELERATED APPROACH - 44 WEEKS: By deploying an IT transformation management tool, like Dashworks, your team will be able to quickly discover, categorize, normalize, assess and deploy thousands of assets — shaving off 65% off the project timeline. By leveraging modern datawarehousing and Big Data, your entire organization has a single version of the truth and your IT team always stays in control. 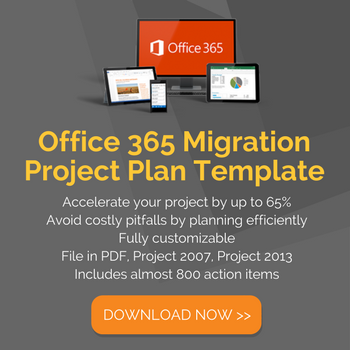 6) How Can I Determine The Budget For This Migration? 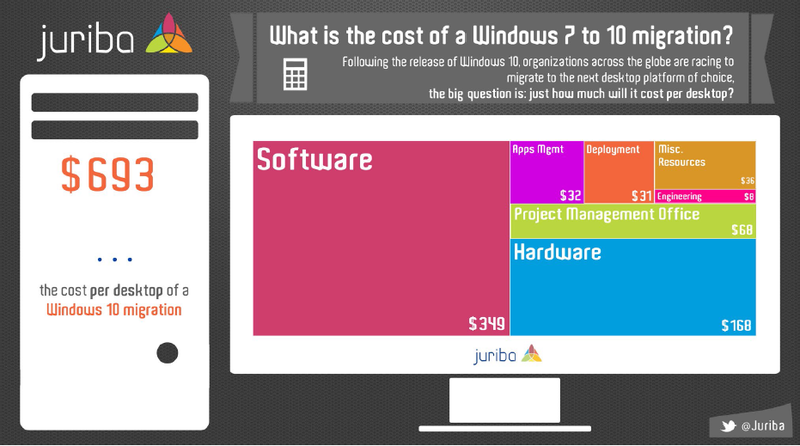 Budgeting for a Windows 10 migration before your IT department knows what they are dealing with can feel like a Catch-22. You need a budget to start, but you won't know how much. On average, you can assume that, by using the traditional approach, you will spend about $693 per desktop. So, if you know you will have to migrate 25,000 employees, you will roughly have to find a budget of $17 million. As you can see below, about three quarters of that (74.6% or $517/device) will be dedicated to software and hardware, while the rest is spent on project management, application management, deployment, engineering and other resources. By using the accelerated approach with modern IT transformation tools, you can cut about 15% off that cost, saving you about $26 per device or $2.598,750 in our example. However, by using the tool, you will also be able to cut down about 60-65% of the project time and, on average, consolidate your software licences by about 30% in addition to the 15% savings. As you can see from the processes involved, the complexity of this project is enormous and your team will run into roadblocks along the way. We recently surveyed our customers and we found that application compatibility is by far the biggest road block. Windows 10 affects more than 1,500 other applications in your organization, and only 25% of applications installed will be out-of-the-box compatible with the new operating system. The rest will need to be consolidated, retired, tested further, or need an upgrade path. In addition to compatibility issues, companies cite not enough project resources, budget restraints, time, internal skills and executive buy-in as obstacles. 8) What Migration Tools Do I Need? While this sounds like a big investment in tools, deploying this stack will not only result in improved ROI for the project but also puts your organizations miles ahead for the next IT Transformation project and paves the way to achieving Evergreen IT. Embarking on such an enormous undertaking as a Windows 10 enterprise migration comes with big risks. A project like this can easily run over budget, over time and, if not managed correctly, becomes a major disruption to the business for months, if not years. This is due to the fact that it is incredibly complex and it touches mission-critical assets: the very devices your work force is using every day. It also brings up a myriad of related questions around security concerns, BYOD policies, and application knowledge and remediation issues. Because projects like this tend to be very resource intensive, they often drain away valuable time and resources from other strategic initiatives. However, one of the biggest risks just reinventing the Windows 10 migration wheel. By tackling the project straight on with spreadsheets and hand-cranked databases and not putting in place strategic tools and processes for managing the desktop moving forward, you not only risk taking much longer and eating up significantly more resources than necessary, you also miss a great opportunity to get a handle on your software and hardware estate once and for all (e.g., your software asset/licence management problem) and to position your organization in a way that it can leverage synergies better going forward! 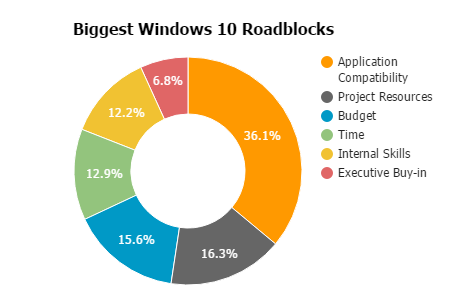 Your investments in your Windows 10 could have huge compounding returns-on-investment if you choose to strategically implement the right tools, processes, and procedures from the get-go so your team can leverage project synergies and pave the way to continuous IT management or Evergreen IT. Since tooling that is maintained is always up-to-date and actionable, your team can continue to leverage the investment to now make upgrades in "Business as Usual" mode without causing further disruptions to the entire system. With the right organizational processes in place, moving towards Evergreen IT will make your organization more nimble and agile, which in turn results in more velocity and competitiveness. We hope this executive view on Windows 10 migrations will help you to accelerate your migration project significantly and make future IT transformation initiatives easier. 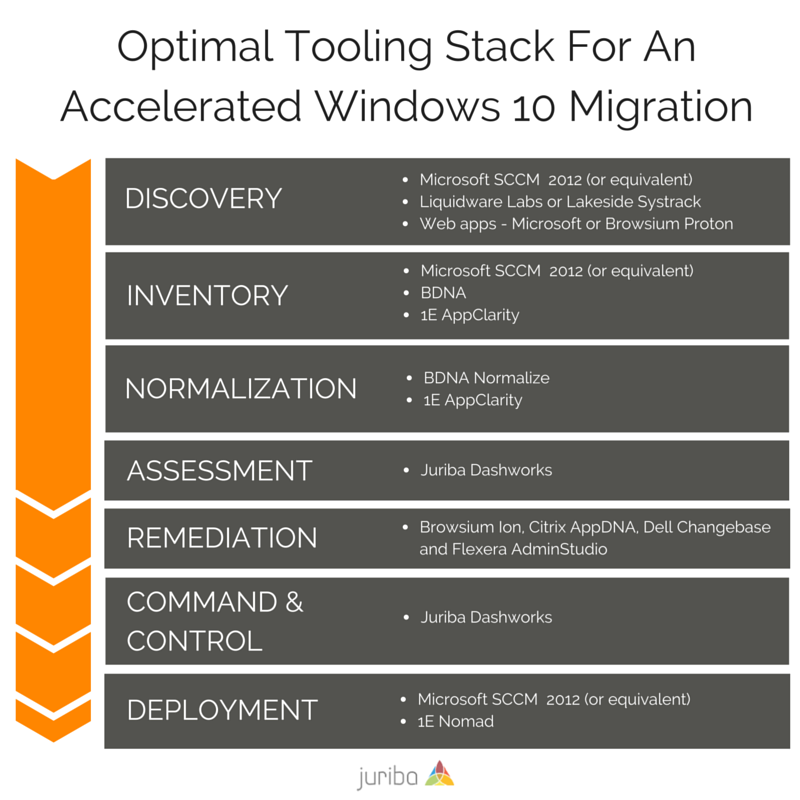 Want to find a better way to accelerate your Windows 10 migration. Learn from industry leaders from HP, BDNA, and Juriba how to do just that in this on-demand webinar.